Peter and I eagerly peered out the airplane window to see African landscape emerge at the edge of the Atlantic Ocean when landing to Monrovia, the capital city of Liberia. We were excited to come to this country because neither one of us had ever been there before. Liberia is a fascinating nation with an unusual origin, established as a colony for former African American slaves and their free descendants. In 1821-1838, the first settlement, known simply as Liberia, was established. “Liberia” comes from the word “liberty”, meaning equal rights and freedom to all people. On July 26, 1847, Liberia declared its independence. The nation experienced two painful civil wars 1989-2003. There were unspeakable atrocities with thousands maimed and more than 400,000 dead, often at the hands of brutally enlisted child soldiers. Christian and Muslim women joined forces to create Women of Liberia Mass Action for Peace, and peace was finally achieved in 2003, but the scars remain. 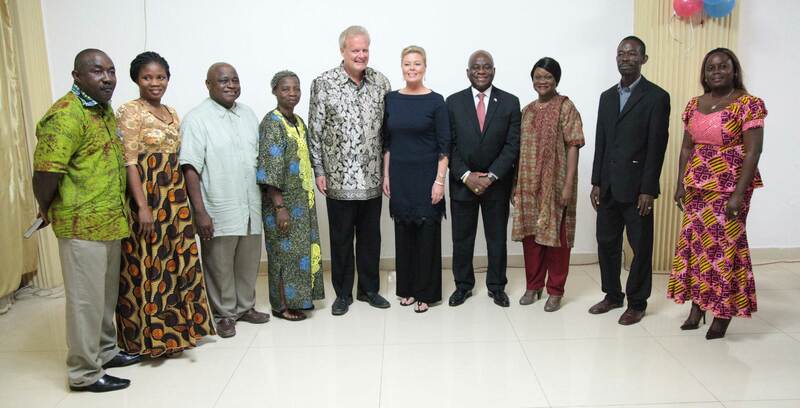 The morning after our arrival the Vice President, Mr. Joseph Boakai, had invited us for a breakfast meeting, and after a lengthy discussion we prayed with the Vice President and his closest co-workers. The wounds and destruction of the civil wars are still tangible, and the subject became often up in the conversations. 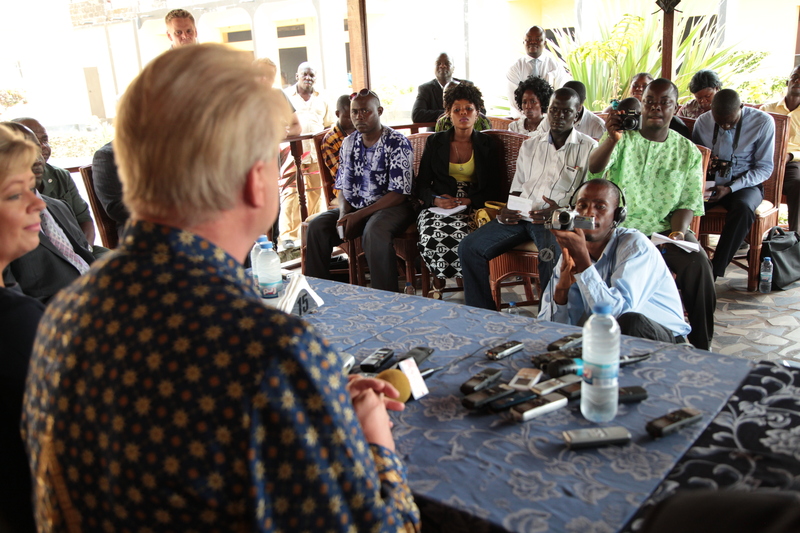 A bit later in the day, we hosted about 25 journalists in the Press Conference; one of them was from a Muslim radio station. Typically journalists want to know what Peter thinks about specific political issue – no matter what country we are in. This time one hot topic was related to the gay and lesbian rights. Often these questions are traps, as the media would like cast Peter as opposed to the president or some other politician. 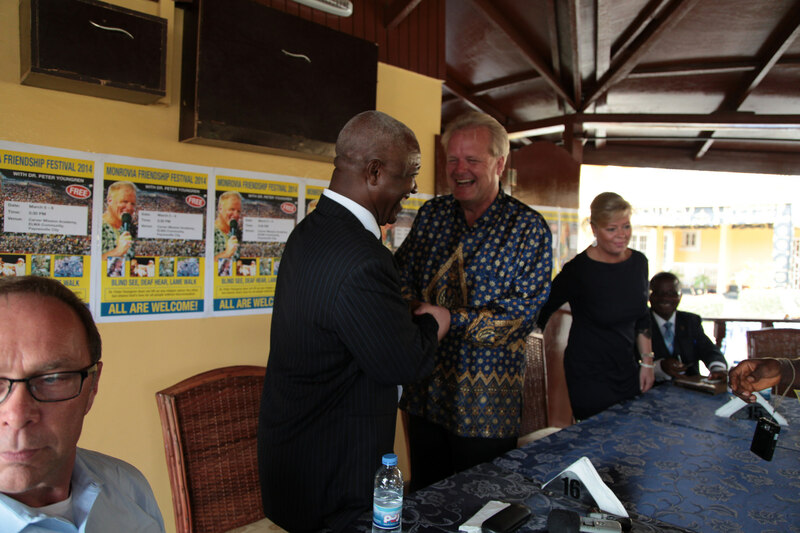 Peter wisely referred to Liberia’s own democratic decision making process, and re-emphasized why we conduct Friendship Festival, namely to share God’s love through Christ for all. Peter invited the journalist to report directly from the Festival field, so that they could see and verify themselves what Jesus would do among the people. Every one of them had seen our posters and billboards, which proclaimed that the “blind will see” and the “deaf will hear”. Peter told the journalists that God confirms the Gospel of Jesus Christ with His love that produces miracles. 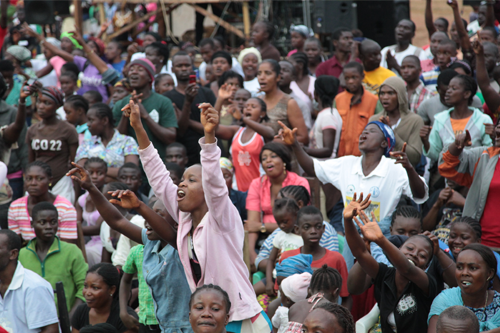 One of the great favors of God during the Liberia outreach was that Liberia’s National Television Real TV filmed the whole Festival, so their crew was in the field every night to see for themselves what God was doing. "This has never happened before"
After the Press Conference it was off to the Friendship Dinner. We were happily surprised how large the Muslim delegation was. Actually three different groups from the Islamic faith were present in addition to a couple of individual sheiks. According to local pastors, this was “history in the making”. 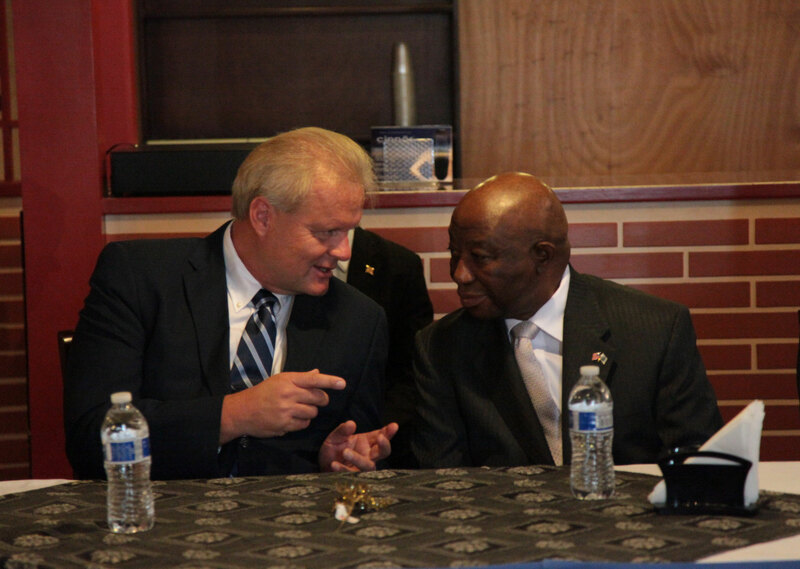 Bishop George Harris, head of the Liberia Evangelical Association reported that he and other pastors had never attended a gathering with Muslims present. We could literally see how many eyes were widened when the speeches were given, and prejudices were dropped, especially as Peter presented the Gospel without compromise. We heard afterwards from many of the participants, “This has never happened before”. I sat with the Justice of the Supreme Court, Ms. Sie-A-Nyene Youh, and the Minister of National Defense, Mr. Brownie J. Samukai, on the one side and Peter on the other. I couldn’t help but notice how peaceful and glad Mr. Samukai’s spirit was. Probably a good characteristic for a Defense Minister! In her speech Ms. Youh welcomed us warmly to Liberia and emphasized how she believes that the friendship approach that Peter conveys, is the only right way in reaching people. Finally first Festival night had arrived. Not surprisingly, we faced unexpected challenges. When we arrived to the field there were hardly any lights on – it looked dark, but nonetheless we heard praise and worship songs echoing from the field. What was going on? Naturally we never stop when something like this happens, but push forward. Next thing that happened was that the sound was gone! None of the three generators functioned at this critical moment. We sat down, and just before when Peter walked up to the pulpit, the lights and sound were suddenly turned on. Well, this is Africa even in 2014! Princess is the name of a girl that I particularly remember from the first night. She was thirteen years old and had been blind for six years. Princess had not attended school because of her blindness. Her father is a medical doctor, but tragically had not been able to help his daughter. 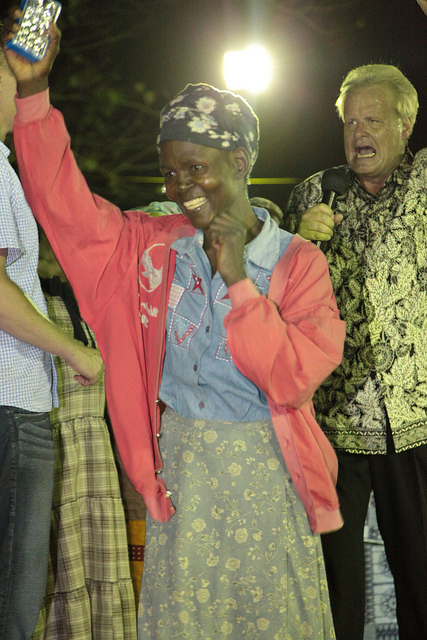 It was priceless to see Princess’ joy after she had received her eyesight. One woman realized she was healed while walking home from the Festival field. She had not been able to speak for two years. Our TV crew was still on the field packing their cameras, when she returned to the field, crying and laughing at the same time, while excitedly telling our team what had happened. The next night she brought cat-scans, MRIs and a certificate from her doctor to verify the miracle God had done for her. Another lady had been partially blind since 1977, due her optical nerve being damaged in a dental operation. 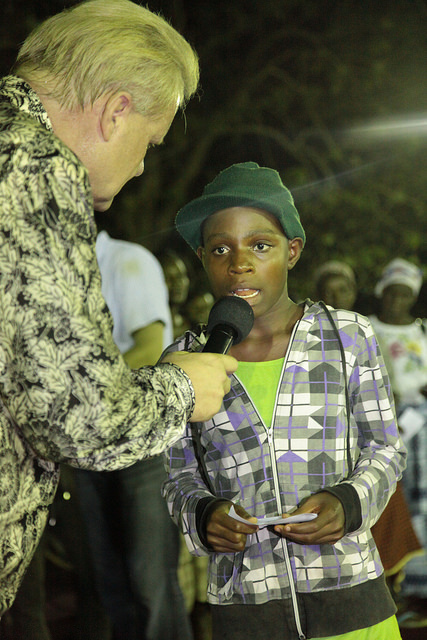 Jesus healed her miraculously. Can you imagine her joy after being disabled for 37 years! 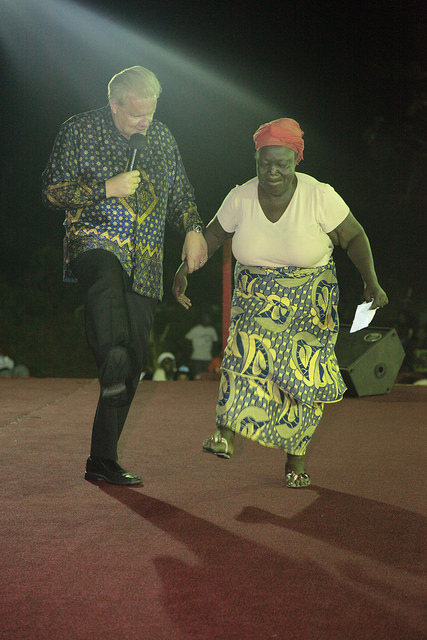 Many in Monrovia were used to how to respond to a Christian preacher, but maybe not so much to Jesus Himself. Peter encouraged people, not look at him as some kind of a mediator between them and Christ, but to connect with Jesus personally. This helped many to receive healing, and we saw a lot of miracles during the week. On the last Festival night several tumors were gone; several as large as an egg or a fist disappeared instantly. 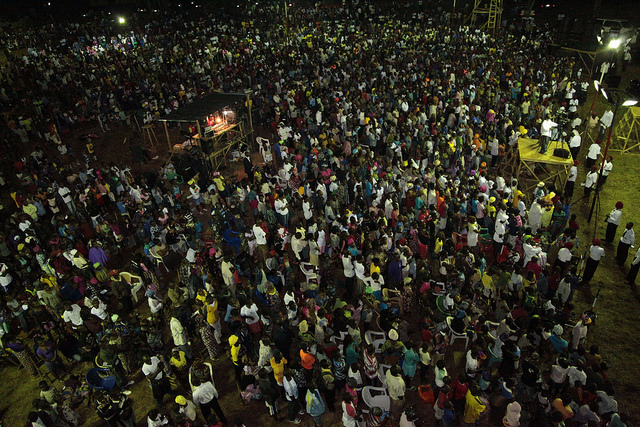 When Peter gave the invitation to receive Christ, thousands responded each night. Whether people are Muslims or religious Christians all need a real, living Jesus. Only He can give the freedom that each individual is looking for. “Christianity” can be filled with dead traditions and local customs, which don’t have life in them. The answer is in Christ Himself. Thank you! You are a vitally important link in bringing Christ’s freedom and life to people. Thank you for your love for the world!